If the name doesn’t sound familiar, that’s okay. For the past two years, the common reference to these was either “The Bomax Drive Apartments” or the “Park Grove Realty Apartments”, either of which was used interchangeably. The official name according to Park Grove Realty’s webpage is “East Pointe Apartments”. East of what, I dunno. Park Grove Realty is a new company headed by a group of long-time developers and real estate professionals. 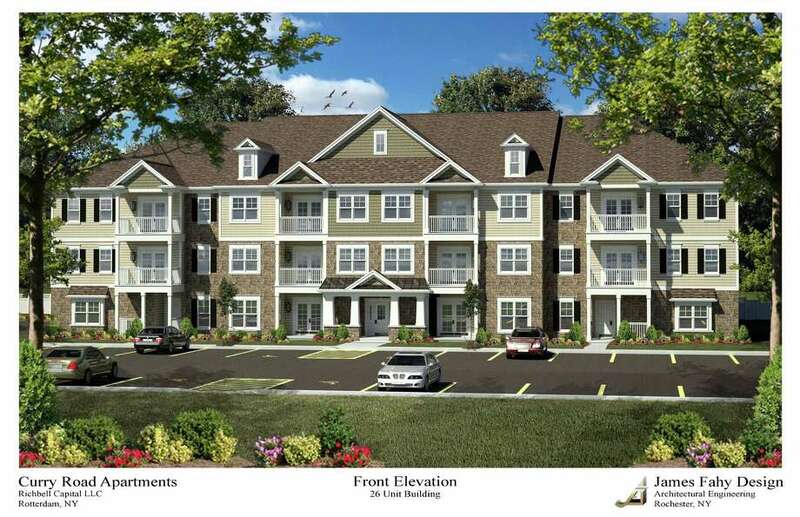 Andrew Crossed and Andrew Bodewes cut their teeth at Conifer Realty, a regional affordable housing developer based out of Rochester (readers might be familiar with some of their local projects, including Linderman Creek, Cayuga Meadows, and Poet’s Landing). They knew their way around development and had familiarity with the area. Not only that, they were working with Tom LiVigne, who has been on the board of many local projects and recently retired as the president of real estate operations at Cornell. While LiVigne was at Cornell in 2008, the university purchased a 19.46 acre parcel on Bomax Drive. The property was zoned for business and technology, which is intended for commercial office, warehousing or tech-focused industrial space, which is what Cornell originally had in mind. But, with the onset of the Great Recession, and a re-assessment of Cornell’s needs, nothing ever came forth for the property. A little bit of speculating here, but because Conifer’s Cayuga Meadows had been floating around since the late 2000s, LiVigne would have been professionally familiar with Crossed and Bodewes. It seems likely that as LiVigne retired in early 2015, and Crossed and Bodewes launched their company a few months later, they might have approached him with the idea of an Ithaca project, knowing the market’s strong economics and housing deficit. LiVigne was familiar with Cornell’s excess holdings, and whatever discussions he had with Park Grove post-retirement led to the idea of a project on this property. The project was first conceived and brought before the village of Lansing in July 2016. 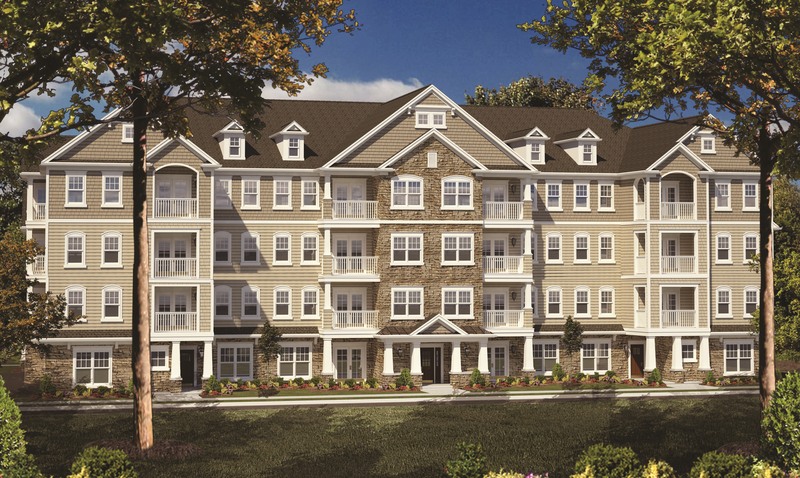 East Pointe is a 140-unit townhouse complex, fourteen strings of ten units, plus a community building, situated on a wooded vacant parcel on Bomax Drive. 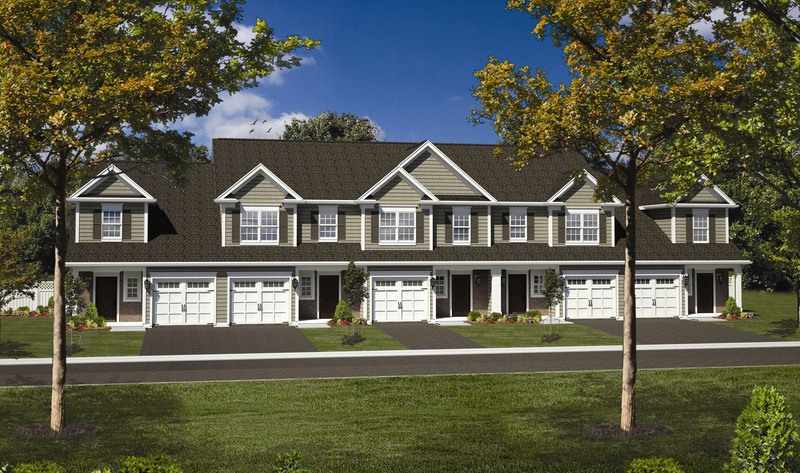 The intent was to explicitly avoid Collegetown and Downtown, and do a project geared towards the upper-middle class market segment, more specifically empty nesters and young professionals who may be moving in for work, but have yet to buy a house (this is exactly the same sub-market and words used by the developers of the 102-unit Cayuga Orchard project over in the town of Lansing, and even bears a passing resemblance). Arguably, a modest slice of graduate/professional students is possible as well. To make the project possible, the zoning would have to be changed to high-density residential – the village planning board wanted a traffic study and wasn’t excited that there was no affordable housing here (the project team argued the asking price Cornell wanted made affordable housing infeasible), but was otherwise open to the idea of the zoning change; no one had developed a business and technology space since 2005, and residential was seen as a downzoning from what could have been done there, should Cornell have really pushed for a large office of research building. The neighboring developer, however, was not okay with the rezoning. I don’t intend to rehash Forest City Realty and the Jonson family’s attempt to stop the project, but the argument was that it was a “spot rezoning” and that it was illegal. The Jonsons felt the units would decrease the desirability of their own project, the luxury for-sale townhomes in the Heights of Lansing. It became so impassioned that Lisa Bonniwell (Ivar and Janet Jonson’s daughter) ran herself and allies to try and take over the village Board of Trustees and mayorship last year in an effort to stop the proposal – they lost by a large margin. They also took the village to state court, lost, appealed, and lost again. The village estimates, with considerable distaste, that although they won, the court cases cost them close to $50,000. It’s because of the lawsuit that the timeline gets a little muddled. The rezoning request was filed in September 2016, the public hearing in October, and the zoning change was made in November 2016 – to make it clear, that was the rezoning, not the project. The project wasn’t approved until November 2017, after the lawsuit was rejected and had gone to an appeals court. For a little while, Park Grove had a “continue at your own risk” for preparing final drawings and legal paperwork, given that the appeal was not declined by the state court until February 2nd 2018. The first real sign the project was moving forward came on March 16th of this year, when Cornell sold the land to Park Grove for $1.5 million, $300,000 more than what the university paid in August 2008. Each string will have four units on the first floor, and six units on the second floor. Each unit has their own entrance, and the project is being described by the developer as “walk-up garden style“. The mix of units is 36 one-bedroom units, 90 two-bedroom units, and 14 three-bedroom units – since 36 and 90 don’t break down evenly by 14, I’d expect slightly difference unit mixes per building, and perhaps that will result in some slight design differences for things like window and door placement. However, they’ve only ever shown one apartment string in their official renders. The renders above are from early in the process (top), and the one they uploaded to the company website last week (bottom) – note the differences in the end garages and in the second floor/roof on the right side of the image. it may be a change in design, or it may be two different building designs they plan to utilize depending on unit layout. Have to wait and see on that one. The one-bedrooms will be about 900 square feet and go for $1,400/month, according to an early interview with the Ithaca Times. The 1,300 SF two-bedroom units will go for $1,700/month, and the three-bedrooms, which will be about 1,400 SF, will for $1,900/month. The Lansing Star gives similar stats. Renters will get “high end finishes and amenities”, with possible amenities including the community building with swimming pool, bocce ball court, walking trails, a community garden and a dog park. I have not seen any building costs or local lending activity associated with the project, but if it’s in the ballpark of the nearby Village Solars (which is $2-$3 million per building), then it would not be unreasonable to expect something in the range of $30 million (of course, I am not the county tax assessor, so don’t take my word as gospel). The architect, James Fahy Design Associates of Rochester, has a lot of experience with newer suburban developments, both single-family and multi-family. A google search (their website hasn’t been updated) shows similar gable-loving, shake siding and stone veneer embracing projects in the Buffalo, Rochester, Syracuse and Albany areas. Jess Sudol of Passero Associates is the engineering consultant. Right now, the site is being cleared and graded, with subterranean utilities installs (water/sewer) and early foundation excavation work is underway. The first two apartment strings are expected to be ready by Spring 2019. DGA Builders of Pittsford (suburban Rochester), a division of Pennsylvania-based DGA Construction Group, appears to be the general contractor, and A.E.Y. Enterprises of Macedon (Wayne County) is the site work subcontractor. We can practically call this project complete – the first tenants move in on July 1st. Somewhere along the way, the number of units was reduced from 60 to 58, and it’s not clear whether those were one-bedroom or two-bedroom units (the initial breakdown was 48 two-bedroom and 12 one-bedroom units). No tenants have been named for the twin 1,340 SF retail spaces either. Given that this was the last vacant high-density mixed-use parcel in the village of Lansing, it seems like they got a good project out of it. 58 market-rate units to seniors aged 55+ is a welcome addition the the Tompkins County market, especially as the retirement of Boomers only continues to grow (the market will create demand for another 70 senior-focused units per year over the next several years, as well as market-rate and affordable housing for those without specialized care needs). While not exactly an urban location, it is walkable to nearby shops and restaurants at Triphammer Mall and the Bishop’s Mall across the street, and it will have a bit of an active ground-floor presence through its small commercial spaces. 5% of the units will be built handicap-accessbile, but all will be handicap-adaptable, and the rooftop solar panels are a plus. The project was built and developed by Taylor The Builders in conjunction with the Thaler Family. NH Architecture did the design work, and Cornerstone Group will manage the property. Some cool aerial shots of the site can be seen here courtesy of Taylor and photographer Mick McKee. Interior photos of the nearly finished units and rental information can be found on Craigslist here. There has been significant progress at the Amici House construction site at 661-701 Spencer Road. The 7,010 SF Harriet Giannelis Childcare Center (which will host headstart classrooms and daycare facilities) is fully framed, roofed, fitted with windows, and most of the exterior siding (unsure at a glance if it’s CertainTeed vinyl or fiber cement lap siding, though the top color looks like CertainTeed “Autumn Red”) has been attached. Even some of the trimboards have already been attached along the front entry/porch. It would seem likely that, if logistics provide for it, the building could be open for its first students in the fall. To be honest, the design is a bit of a surprise – the original building design by Schickel Architecture was the same size but looked quite different, and the revisions were never uploaded (maybe the planning and building department had something on file, but there was nothing online). Note that most of that front-facing concrete slab is going to backfilled (partial refilling of the excavated area). As for the five-story mixed-use structure, that is just getting underway with structural framing. The first floor, which will have offices and meeting space, has its steel skeleton and some of its exterior stud walls have been attached. The second floor is just getting underway, and the masonry blocks for the elevator core have been assembled. It appears the existing TCAction building will be getting a new roof as part of the construction work – note that they are not able to work here while construction is ongoing, and have temporarily relocated to 609 West Clinton Street. The 20,712 SF building, with its offices and 23 efficiency units for homeless and/or vulnerable young adults, will be completed early next year. The background information and planning for the project can be found in the March introductory post and photo set here. Prolific regional contractor Welliver is the construction manager for the $8.25 million project. The new endcap spaces on the former KMart (now Hobby Lobby) Plaza at 742-744 South Meadow Street. The first set of photos are the northern endcap with 7,315 SF of retail space, next to PetSmart. The southern endcap is a 14,744 SF space being built where K-Mart’s garden center used to be, which I think explains the huge chunks of concrete slab piled out in front. With no tenants formally announced, these spaces will not be completely finished on the inside – all utilities will be in as well as structural supports and insulation, but the space will be fitted out to the needs of the tenants, so things like flooring, fixtures and interior finishes will wait until someone has signed a lease with Benderson Development. I did not see anything on file for a fit-out in the city of Ithaca’s building permits paperwork (however, I did see last week that Elmira Savings Bank landed an unnamed tenant for its second floor office space at 602 West State Street). Oftentimes you’ll see retail real estate managers try to find tenants that complement each other, say a salon and a cafe, or a sporting goods store with a women’s clothing store (the somewhat sexist argument there is that the ladies go to one while their male partners go to the other). Increasingly, entertainment and recreation options are becoming tenants – take for instance the announcement that a live theatre company will be taking 12,000 SF of space in the Shops at Ithaca Mall. That can help existing tenants by drawing in unique customer traffic that may choose to browse, shop and dine at other mall venues. Back to the site at hand, the decorative facade appears to be initially shaped with plywood over steel stud walls, with a layer of fireproof gypsum laid over the top of that (except toe cornices, which appear to have no plywood layer, only gypsum). The bases are concrete masonry walls. The textured stone veneers and fiber cement panels will come later.